UNITED NATIONS, January 7 -- With the UN and Western members of its Security Council now looking for solutions about Gaza in the country to the south, the question has arisen whether Egypt is violating international law in blocking entry to those seeking to flee the bombing. Wednesday at the UN, Inner City Press asked Human Rights Watch expert Sarah Leah Whitson to elaborate on her cursory statement that Egypt is complicit in war crimes for keeping closed its Rafah crossing with the Gaza Strip. Ms. Whitson responded that Egypt is legally required to open the crossing, but has refused to do so "unless representatives of Fatah" man the crossing. She called this "injecting a political formula onto a humanitarian situation" and legal responsibility. Video here, from 46:20. 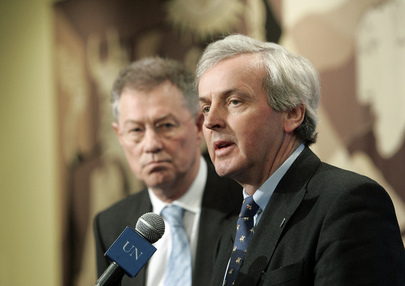 The UN's main envoy to the region, Robert Serry, views things decidedly differently. Inner City Press asked Serry to respond to HRW' statement that Egypt is violating the law by blocking those who flee at the Rafah crossing. "I'm a bit puzzled by the charge," Serry said, noting somewhat irrelevantly that the Egyptian Red Cross has been "active with medicines" in the Gaza Strip, and that some patients have been allowed out through Rafah. But what about those who are fleeing the bombing of their homes? Serry said, tellingly, "I really don't want to comment further." Video here, from Minute 41:18. While Serry is not alone in this solicitous approach to Egypt, even the UN's refugee chief Antonio Gutteres has said that international law requires the opening of Rafah. Earlier on Wednesday, UN humanitarian coordinator John Holmes said the Gaza conflict is unique because its victims "have nowhere to flee to." Inner City Press asked if he meant by this the blockage of the borders, including by Egypt. Holmes nodded. Video here, from Minute 50:07. So why would the UN's humanitarian and refugee chieftains say the border must be opened, while top political envoy Robert Serry disagrees and says he's puzzled? What is the UN's position? For now we note: Politics kills.